While the Glitzkoin crypto currency is bound to draw immense interest, the project has more than just a crypto currency to offer. Team resources in this project include proficiency in both, blockchain technology and the diamond trade. Glitzkoin leads the new trend of projects that, are focused on a specific industry. The project is poised to improve productivity and market share for the industry. Diamond sellers have experienced subdued market sentiments in the past decade. There are a few factors that are responsible for dampening buyer interest. The marketing strategy for diamonds has remained old and lethargic. Reliance on an ever growing chain of brokers and the inability to access new buyer groups, has resulted in lack luster sales. The Glitzkoin project includes a high-tech platform nicknamed – DiaEx. Diamond buyers and sellers both big and small, can confidently conduct their transactions on Diaex irrespective of their geographic location. The platform is implemented on the state-of-the-art blockchain. Both big and small diamond sellers can list their diamonds on the blockchain. Every diamond that is listed, would necessarily have a diamond certification from one of the leading diamond testing laboratories. The seller discloses complete information about a diamond at the time of listing, the price expected is also mentioned upfront. Unlike the conventional trading of diamonds, where a buyer is placed at the end of a long chain of middlemen. The Glitzkoin diamond blockchain, connects the buyer directly to the diamond asset listed by the seller. No middlemen means no inflated prices, this in itself has the potential to positively impact the sale of diamonds. A diamond seller on the blockchain, would have access to a market base that, would otherwise remain hidden. Prices that are reasonable without being inflated with multiple commissions and brokerage fees, would be more attractive to buyers. The amazing thing about the DiaEx market environment is that, it is not restricted to specific geographical regions. The use of the Glitzkoin GTN crypto to pay for diamond purchases on the DiaEx platform, would eliminate challenges that currency conversions and expensive bank charges create. Diamond traders have for long, hoped to have access to a payment option that did not involve the cumbersome banking system. Before we wrap up this report, it would be a great idea to list the features in the Glitzkoin project that, would potentially drive up the demand for diamonds. The project happens to be the first diamond blockchain to be promoted by a diamond veteran. 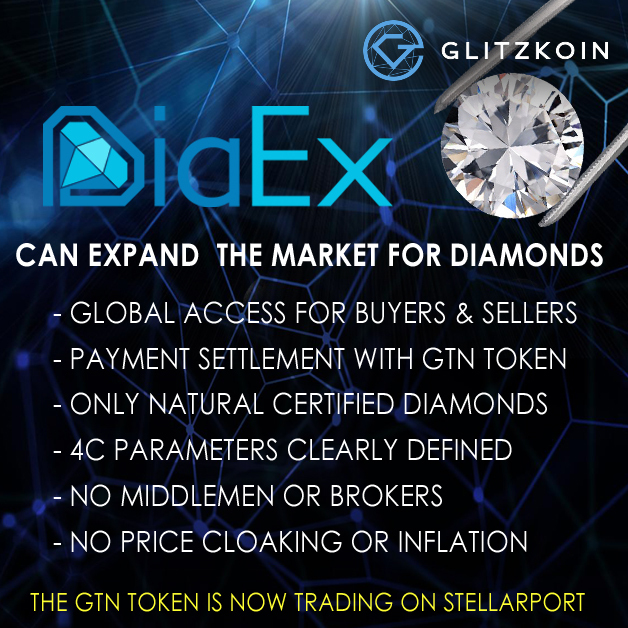 Glitzkoin includes a blockchain based diamond trading platform DiaEx where, diamond traders of all sizes can operate without, the presence of middlemen and brokers. In the absence of middlemen, diamond prices on the DiaEx trading platform, are not inflated with multiple commissions and profit margins. By limiting listings to natural certified diamonds, DiaEx eliminates the possibility of trade in fake and synthetic diamonds. This is something that directly boosts buyer confidence. Since sellers can operate from any point on the globe, the volume of diamonds listed would be significant. Buyers would always find a good selection of diamonds to choose from.